Recalling this day in Something Like an Autobiography, Kurosawa explains the movie to them. 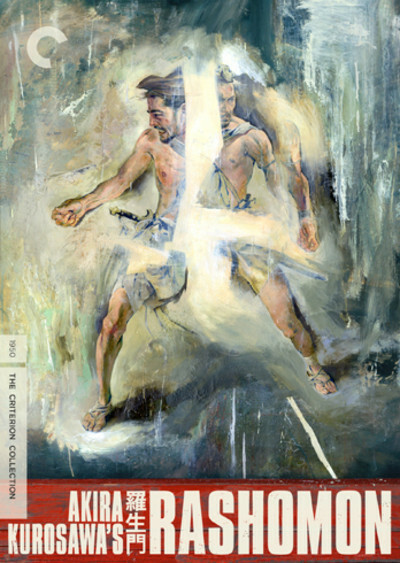 The explanation is reprinted in the booklet that comes with the new Criterion DVD of "Rashomon." Two of the assistants are satisfied with his explanation, but the third leaves looking puzzled. What he doesn't understand is that while there is an explanation of the film's four eyewitness accounts of a murder, there is not a solution. Kurosawa is correct that the screenplay is comprehensible as exactly what it is: Four testimonies that do not match. It is human nature to listen to witnesses and decide who is telling the truth, but the first words of the screenplay, spoken by the woodcutter, are "I just don't understand." His problem is that he has heard the same events described by all three participants in three different ways--and all three claim to be the killer. "Rashomon" (1950) struck the world of film like a thunderbolt. Directed by Kurosawa in the early years of his career, before he was hailed as a grandmaster, it was made reluctantly by a minor Japanese studio, and the studio head so disliked it that he removed his name from the credits. Then it won the Golden Lion at the Venice Film Festival, effectively opening the world of Japanese cinema to the West. It won the Academy Award as best foreign film. It set box office records for a subtitled film. Its very title has entered the English language, because, like "Catch-22," it expresses something for which there is no better substitute. In a sense, "Rashomon" is a victim of its success, as Stuart Galbraith IV writes in The Emperor and the Wolf, his comprehensive new study of the lives and films of Kurosawa and his favorite actor, Toshiro Mifune. When it was released, he observes, nobody had ever seen anything like it. It was the first use of flashbacks that disagreed about the action they were flashing back to. It supplied first-person eyewitness accounts that differed radically--one of them coming from beyond the grave. It ended with three self-confessed killers and no solution. Since 1950 the story device of "Rashomon" has been borrowed repeatedly; Galbraith cites "Courage Under Fire," and certainly "The Usual Suspects" was also influenced, in the way it shows us flashbacks that do not agree with any objective reality. Because we see the events in flashbacks, we assume they reflect truth. But all they reflect is a point of view, sometimes lied about. Smart films know this, less ambitious films do not. Many films that use a flashback only to fill in information are lazy. The genius of "Rashomon" is that all of the flashbacks are both true and false. True, in that they present an accurate portrait of what each witness thinks happened. False, because as Kurosawa observes in his autobiography, "Human beings are unable to be honest with themselves about themselves. They cannot talk about themselves without embellishing." The wonder of "Rashomon" is that while the shadowplay of truth and memory is going on, we are absorbed by what we trust is an unfolding story. The film's engine is our faith that we'll get to the bottom of things--even though the woodcutter tells us at the outset he doesn't understand, and if an eyewitness who has heard the testimony of the other three participants doesn't understand, why should we expect to? The woodcutter's opening journey into the woods is famous as a silent sequence which suggests he is traveling into another realm of reality. Miyagawa shoots directly into the sun (then a taboo) and there are shots where the sharply-contrasted shadows of overhead leaves cast a web upon the characters, making them half-disappear into the ground beneath. In one long sustained struggle between the bandit (Mifune) and the samurai (Masayuki Mori), their exhaustion, fear and shortness of breath becomes palpable. In a sequence where the woman (Machiko Kyo) taunts both men, there is a silence in which thoughts form that will decide life or death. Perhaps the emotions evolved in that forest clearing are so strong and fearful that they cannot be translated into rational explanation. The first time I saw the film, I knew hardly a thing about Japanese cinema, and what struck me was the elevated emotional level of the actors. Do all Japanese shout and posture so? Having now seen a great many Japanese films, I know that in most of them the Japanese talk in more or less the same way we do (Ozu's films are a model of conversational realism). But Kurosawa was not looking for realism. From his autobiography, we learn he was struck by the honesty of emotion in silent films, where dialog could not carry the weight and actors used their faces, eyes and gestures to express emotion. That heightened acting style, also to be seen in Kurosawa's "Seven Samurai" and several other period pictures, plays well here because many of the sequences are, essentially, silent. Film cameras are admirably literal, and faithfully record everything they are pointed at. Because they are usually pointed at real things, we usually think we can believe what we see. The message of "Rashomon" is that we should suspect even what we think we have seen. This insight is central to Kurosawa's philosophy. The old clerk's family and friends think they've witnessed his decline and fall in "Ikiru" (1952), but we have seen a process of self-discovery and redemption. The seven samurai are heroes when they save the village, but thugs when they demand payment after the threat has passed. The old king in "Ran" (1985) places his trust in the literal meaning of words, and talks himself out of his kingdom and life itself. Kurosawa's last film, "Madadayo" made in 1993 when he was 83, was about an old master teacher who is visited once a year by his students. At the end of the annual party, he lifts a beer and shouts out the ritual cry "Not yet!" Death is near, but not yet--so life goes on. The film's hero is in some sense Kurosawa. He is a reliable witness that he is not yet dead, but when he dies no one will know less about it than he will.